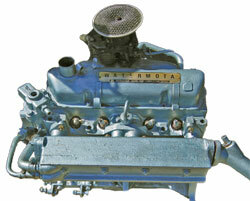 Petrol engines suitable for installing into boats were (and still are) developed from various Ford engines. This allowed all of those potential Anglia sailors out there to take to the water in an engine that they were already familiar with. These various Ford engines were marinised by different manufacturers. Amongst these were Parsons, CT Marine, Wortham Blake and Watermota. The different versions of the engines are easy to distinguish. The pre-crossflow versions have the carburettor on top of the exhaust manifold and the crossflow versions have the carburettor on the opposite side of the head to the exhaust manifold, the gases flow across the head hence the term 'crossflow'. The Marine engine is not quite the same as your standard car engine. There are certain things that need to be done to make it safe to operate within the environment of a boats engine bay. The most notable differences between a marine engine and an automotive engine are the electrical system, the cooling system, the exhaust system, and the fuel system. Additionally, items such as heads and cams are usually different. Here we will just cover a few of the differences to give you a flavour of the modifications that are made to a car engine to marinise it (this is not intended to be an exhaustive list). In a car any petrol or vapour leak quickly disperses through the bottom of the engine bay. In a boat, the sealed engine compartment does not afford the same luxury. Therefore the electrical system is modified to eliminate the possibility of sparks occurring within the system. Marine starters and alternators are modified so they won't release sparks and ignite and gas vapour that may be in the engine compartment. Marine carburettors are modified so they won't flood outside the carburettor. If there is a problem or there is too much fuel in the carburettor, it will flood back into the engine. 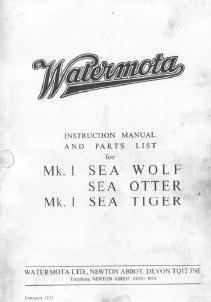 A 135 x 210mm - 20 page instruction book for the Watermota Sea Wolf, Sea Otter and Sea Tiger Engines.